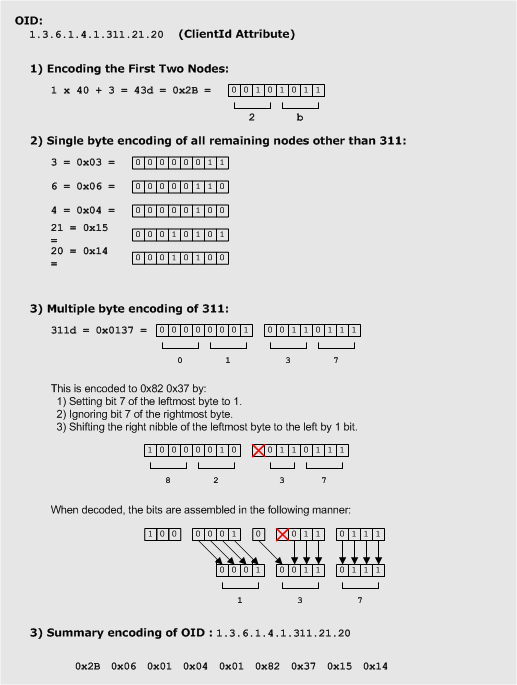 The first two nodes of the OID are encoded onto a single byte. The first node is multiplied by the decimal 40 and the result is added to the value of the second node. Node values less than or equal to 127 are encoded on one byte. Node values greater than or equal to 128 are encoded on multiple bytes. Bit 7 of the leftmost byte is set to one. Bits 0 through 6 of each byte contains the encoded value. These points are shown by the following illustration. The following example shows how the ClientId attribute is encoded in a certificate request. |  63 72 6f 73 6f 66 74 2e     ;   crosoft.